Monday through Friday, 8:30 a.m. to 5 p.m.; Saturday, 10:30 a.m. to 5 p.m. The wild horses of the Currituck Outer Banks have survived nearly 500 years of fierce Nor’easters and hurricanes. They are truly representative of the Outer Banks spirit – untamed and rugged – and are an integral part of what draws hundreds of thousands of visitors to the northern beaches every year. Nowhere else can you see wild Mustangs walking along the beach and grazing among beach homes. The Corolla Wild Horse Fund was formed in 1989 by a group of concerned citizens to heighten awareness about the presence of wild horses in the area. As the Outer Banks became more and more developed, twenty horses were killed or injured by vehicles on Highway 12. 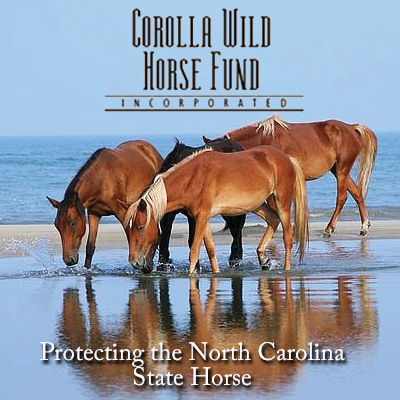 Operating under the Outer Banks Conservationists, Inc., the Corolla Wild Horse Fund worked with Currituck County, U.S. Fish & Wildlife, and the NC Estuarine Research Reserve to have 7,544 acres of the northern-most beaches defined as a horse sanctuary. By 1996, the remaining horses were relocated behind two sound-to-sea fences. The Fund incorporated as a 501 (c) 3 nonprofit charity in 2001. Our sole mission is to protect and preserve the last remaining herd of Spanish Mustangs on the northern Outer Banks. The Colonial Spanish Mustang is on the Critical Breed list of the American Livestock Conservancy and on the Critical list of the Equus Survival Trust. The Colonial Spanish Mustang was also designated the North Carolina State Horse in May 2010. Visit the Wild Horse Museum (it's free and currently being renovated) before taking a tour to find out all the ways you may see the horses.